Fluffy, golden-coloured vadas might taste good as such, but they taste even better when made into tongue-tickling Dahi Vadas. Wash and soak dal in three cups of cold water overnight. Drain off excess water the following day. Grind dal to a smooth paste. Add salt, raisins, ginger, green chillies and gram flour to the batter and whisk for ten minutes. Heat sufficient oil in a kadai. Drop batter in tablespoonfuls in it and fry until light golden. Drain the bhallas and soak them in sufficient quantity of water. Leave for two minutes. Squeeze between your palms to drain out water. Whisk yogurt well with rock salt and sugar to taste. 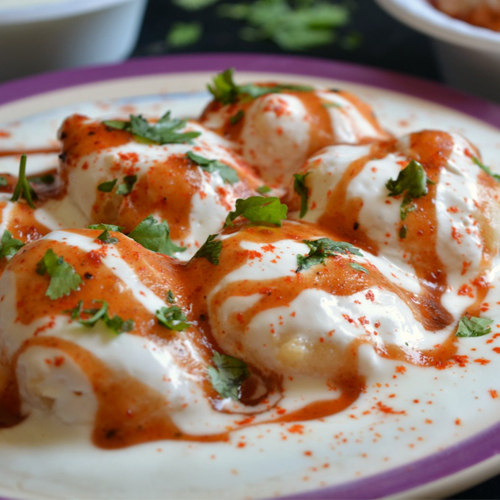 To serve, place bhallas on a plate and cover with yogurt. Drizzle mint chutney and sweet date and tamarind chutney. Sprinkle roasted cumin powder. Garnish with coriander leaves and serve immediately.